DIE Saturni, 10 die Novembris. L. C. J. of C. P. Speaker. Message from H. C. with a Bill;--to return Ly. Arlington's;--and to remind the Lords of the Votes against the Canary Patent. Bill to regulate the Prices of Provisions, &c.
Epus. Oxon. Ds. Thesaurarius Angl. This Day the Lord Chief Justice of the Common Pleas sat Speaker of this House, by virtue of a Commission under the Great Seal of England, in the Absence of the Lord Chancellor. 1. "An Act for encouraging of Coining;" wherein their Lordships Concurrence is desired. 2. Did return a Bill sent from this House to the Commons, for the naturalizing of Isabella of Nassau, Wife of the Right Honourable the Lord Arlington, One of His Majesty's Principal Secretaries of State; to which Bill the Commons do agree. 3. To put their Lordships in Mind of the Votes lately brought up from the House of Commons, concerning the Patent of the Canary Company. 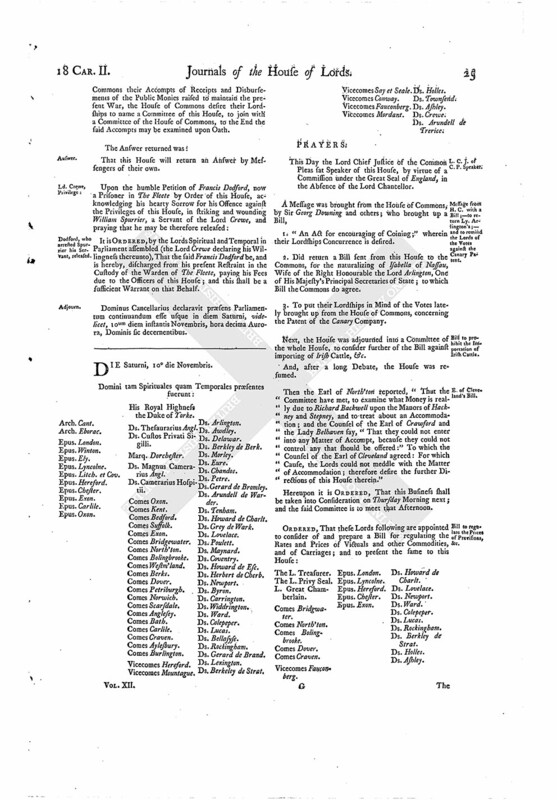 Next, the House was adjourned into a Committee of the whole House, to consider further of the Bill against importing of Irish Cattle, &c.
Then the Earl of North'ton reported, "That the Committee have met, to examine what Money is really due to Richard Backwell upon the Manors of Hackney and Stepney, and to treat about an Accommodation; and the Counsel of the Earl of Crawford and the Lady Belhaven say, "That they could not enter into any Matter of Accompt, because they could not control any that should be offered:" To which the Counsel of the Earl of Cleveland agreed: For which Cause, the Lords could not meddle with the Matter of Accommodation; therefore desire the further Directions of this House therein." Hereupon it is ORDERED, That this Business shall be taken into Consideration on Thursday Morning next; and the said Committee is to meet that Afternoon. 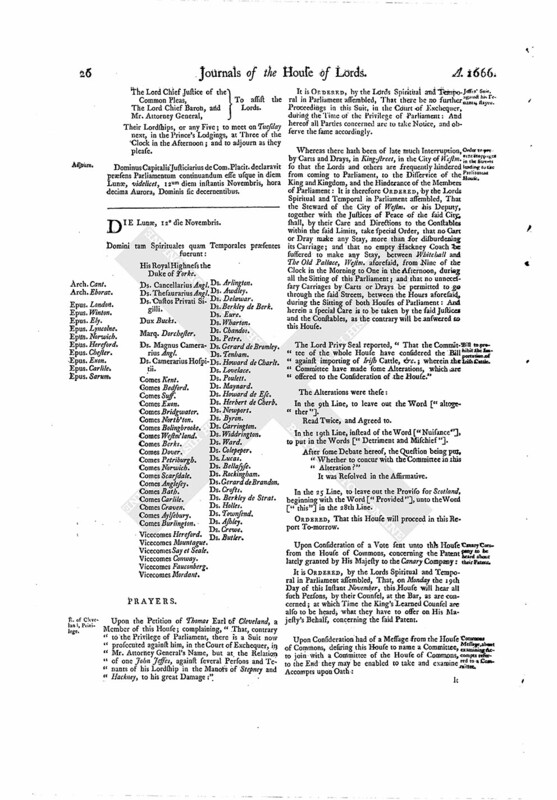 The Lord Chief Justice of the Common Pleas, To assist the Lords. Their Lordships, or any Five; to meet on Tuesday next, in the Prince's Lodgings, at Three of the Clock in the Afternoon; and to adjourn as they please. Dominus Capitalis Justiciarius de Com. Placit. declaravit præsens Parliamentum continuandum esse usque in diem Lunæ, videlicet, 12um diem instantis Novembris, hora decima Aurora, Dominis sic decernentibus.